BRISTOL, Tenn. – NASCAR champion Matt Kenseth said Friday at Bristol Motor Speedway that he currently had no racing plans for 2018. “When I do I’ll tweet something, like on a Monday or something,” Kenseth said. NASCAR’s 2003 premier series champion said he’s not worried about 2018. 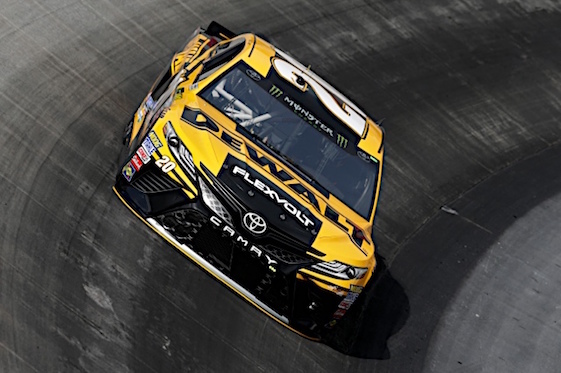 Entering Bristol, Kenseth was ninth in the regular season standings, but in the final point’s position that will be admitted into the playoffs. Currently, there have been 13 different winners this season, which means only three drivers will be admitted to the playoffs via points. With three races remaining, Chase Elliott, Jamie McMurray and Kenseth possess those positions, respectively. A different winner in the final three regular season races will further reduce the number of playoff positions available via points. Chase Elliott, who like his father has his pilot’s license, says he would like to view Monday’s eclipse from the air. Bristol Motor Speedway has created a scholarship in Dale Earnhardt Jr.’s name to be given annually to a Sullivan County Tennessee student interested in pursuing an automotive industry career. “Hopefully, the guys and girls who get that opportunity take advantage of it,” Earnhardt said. “I have been blessed with a lot of things and I don’t need anything else and if the track is going to make an effort and maybe even put some money into something, I would rather them do something that is going to make an impact in somebody’s life. That is an awesome reward for me to see somebody benefit. I think the track should be commended on an effort to do something that is going to be long lasting and impact someone else’s life. Bristol Motor Speedway is located in Sullivan County. Chase Elliott admitted Friday that hosting the Grand Ole Opry was a little nerve-racking. The Opry began on Nov. 28, 1925 when an announcer on Nashville radio station WSM introduced fiddle player Uncle Jimmy Thompson as the initial performer on a new show named “The WSM Barn Dance.” Numerous country careers were launched as the Opry was housed initially in Nashville’s Dixie Tabernacle and historic Ryman Auditorium. On March 14, 1974 it moved to the newly-constructed Grand Ole Opry House where a 6-foot circle of hardwood from the Ryman was placed center stage. Today, its magic continues as every country music artist’s dream is to be asked to perform on the Grand Ole Opry.